We don't need to tell you that data can be beautiful—but the process of putting it in order can look pretty darn good, too. A new site called SORTING aims to make people aware of just how elegant some of computer science's most fundamental algorithms can be. The site provides visualizations of all kinds of sorting algorithms—the ones that organize elements of a sequence into a certain order. It sounds like a trivial problem because it's so easy to comprehend, but in reality millions of hours of research have been invested to make the process more efficient. 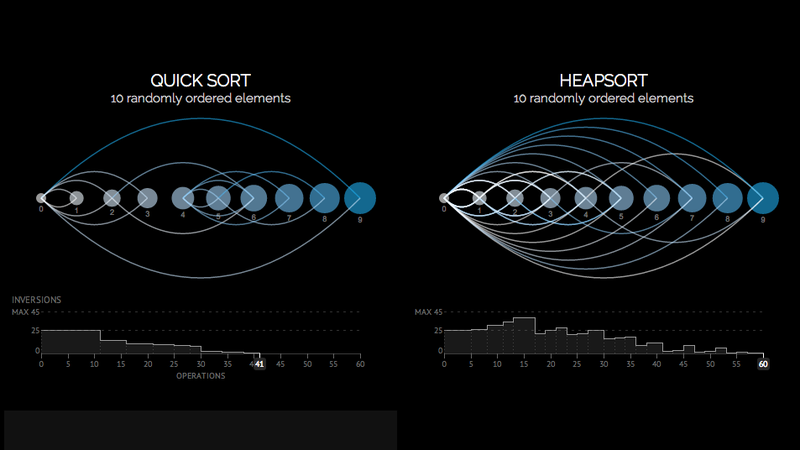 SORTING is an attempt to visualize and help to understand how some of the most famous sorting algorithms work... This project does not want to teach the theory of sorting algorithms, there are amazing resources, books and courses for this purpose. SORTING is for the ones who want to see these algorithms under a different ligth and hopefully appreciate the processing and brain power behind these piece of genius that in many ways have changed the way we live.